Vole Windows Expedition is a new generation file manager, a fast and more graceful way to manage your documents. Vole Windows Expedition Scene-Reproduce feature reproduces all the files and folders that you customized automatically, Docking-tabbed feature lets you dock and table your files and folders as you want. You do not have to manually search, open and close the same files and folders again and again. You do not have to manually adjust the files and folders docking and table position again and again. So have a cup of coffee, open the software lets Vole Windows Expedition do all for you, it will save much time for you every day. With new features like Music Mate, Dual-Explorer, Favorite-Folder, Playback-Folder, VMC Discovery, Countdown Timer, six beautiful color themes and more, it is really a faster and more graceful way to manage your documents. If you are tired of opening the same files and folders again and again every day, if you already have your best files and folders collection, if you do not want to remember the long meaningless paths, if you want to save more time for coffee, you may try Vole Windows Expedition now! One-click operate, gets all files and folder within any scene ready automatically. Instant navigation and accurate position. Scene-Reproduce feature will automatically save the opened files and folder and their docking configuration to your local disk and will restore the opened files and folder same as saved when starts. And more, scene can be exported and imported. If you export your scene and import to as many as other computers, BOOM, all the other computers will open files and folders same as yours. Docking-Tabbed is premium window control technology that lets you dock and table window as you want, Parallel, Vertical, Horizontal, Float, Horizontal Group, Vertical Group, Prominent, etc. This lets you view your web pages more convenient than ever. Most of the software you can imagine cannot provide this complicated feature, such as Windows, Office, iTunes, etc. Up to now, any other file managers don't have this feature. Files and folders, categories, projects, scenes and scene manager five-level topology structure, the heaviest loaded file manager. Vole Windows Expedition can open these huge number of files and folders in single process Windows file explorer or multi-process. 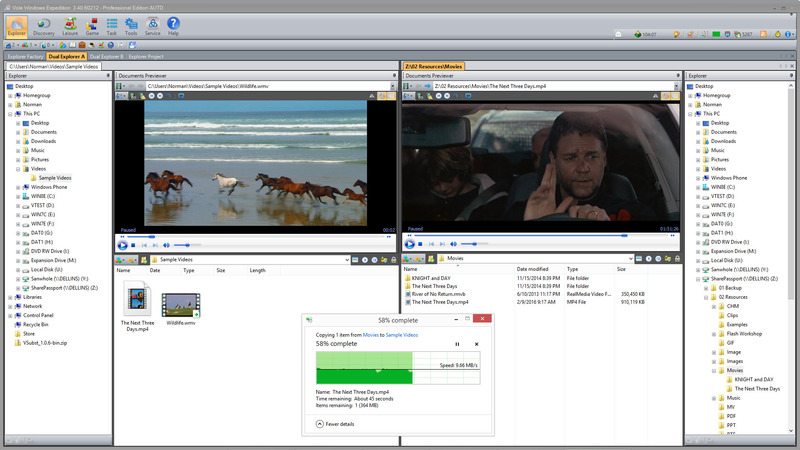 Document Previewer lets you view a variety of resources in the built-in media player. With Documents Previewer, you may view any local disk and online images, audio, video, Microsoft Office Word, Excel, PDF, CHM, VMC, RTF, TXT, SWF, GIF, HTM, HMT, YouTube video, websites, webpage etc. in the built-in media player. You don't have to open other programs. Ten Preset Preview Category lets you view files again with ease. The file will automatically be categorized into ten preset file categories when previewed. You can preview them forward or backward quickly via selecting the file category and click forward and backward button. You may upgrade Microsoft Windows Media Player codec to get better multimedia experience. 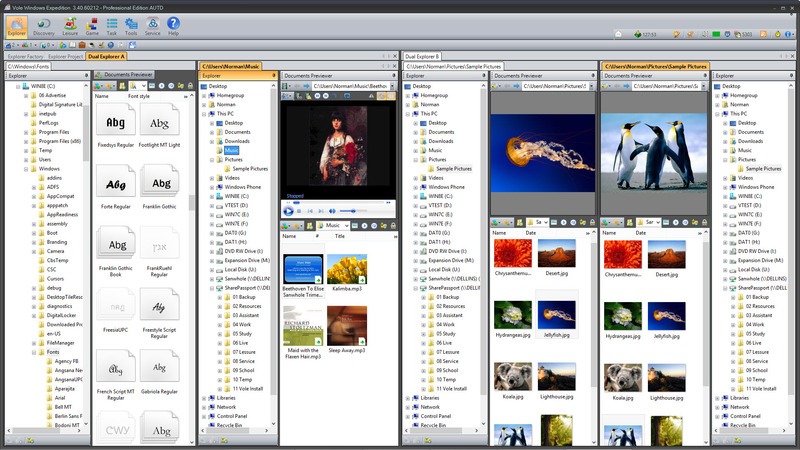 Dual full functional Windows file explorer. What is dual explorer? Vole Windows Expedition dual explorer is a combination of two windows file explorer. 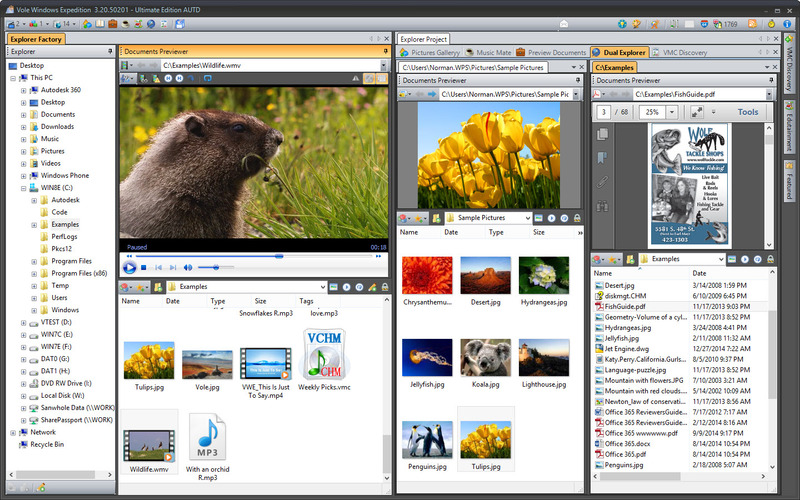 Each explorer is a full function Windows file explorer. You can display the explorers in vertical or horizontal and you can prominent each explorer via one click. Dual Explorer supports favorite-folder feature. Reproduces all the files and folders that you customized. Get all your files and folder ready automatically, a more graceful way to manage your documents. Docking-Tabbed is premium window control technology. Reproduce Docking-Tabbed is unique technology in the world. Files and folders, categories, projects, scenes and scene manager five-level topology structure, the heaviest loaded web browsers. General, Learn, Work, Live, Leisure, Assistant and VMC seven preset categories lets you organize your files and folders with easy. Document Previewer can preview a variety of file types in the built-in media player including images, audio and video, Microsoft Office Word, Excel, PPT, PDF, and CHM etc. The file will automatically be categorized into ten preset file categories when previewed. You can preview them forward or backward quickly via selecting the file category and click forward and backward button. Document Previewer can preview VMC multimedia library directly and enjoy all the features in VMC such as watch YouTube vide, play music or movies etc. Derived from latest Windows File Explorer and everything is 100% compatible including Library, User, This PC, Desktop, Network, Devices and drives, Directory tree, Folder list and view mode, Context Menu, File operation etc. Create as many explorers as you want. Save and load favorite folders. Load standard system preset favorite folders. Playback all the music and video within the folder without creating playlist first. Rapid access Library, Drivers, Network, Desktop etc. Six beautiful color themes relax your eyes. An easy to use counter timer supports sound alarm. A category is a general files and folders table can include as many files and folders as you want. A project can have several categories. You can use the seven preset categories or renew them as you want. A scene can have several projects. You can manage several scenes via scene manager. Create professional stunning websites via built-in Word editor and enjoy Microsoft Office user experience. Online: 774 ©2008-2019 - Powered by Sanwhole, all rights reserved - 3.92.9031.